I really like Joe Calhoun’s theoretical framework in explaining what we try to do here. Like a game of Poker, we are playing against everyone else at the table, unlike Black Jack where you are largely playing yourself. It helps explain why I can say the FOMC is irrelevant while at the same time I spend so much time (all the time) dissecting almost everything it does. People believe, and really want to believe, the central bank is a model of technocratic success; so much so some argue it should be replicated in other areas of government and life. Perish the thought. Since people pay attention to the institution and what it does or doesn’t do, we are forced to play against it until the ugly truth finally emerges. This includes writing a second piece back-to-back on the same FOMC meeting minutes. One of those truths is within the domain of its very core. The central bank is supposed to be first and foremost a bank. Money and all that. It wasn’t ever taught in Economics classes how a couple generations ago these central bankers just skipped out on it. 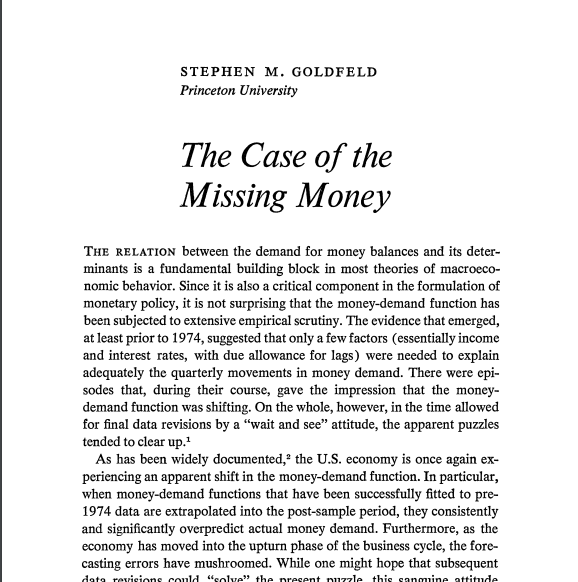 After the “missing money” seventies Economists stopped looking for any. They realized it couldn’t be found and so began crafting another narrative – no one needs to define nor measure money because the single interest rate target will be a sufficient workaround. More than sufficient, it was thought to be an improvement; federal funds in the United States. Perhaps because the world was fixated elsewhere, a lesser known, hugely unappreciated piece of the 2008 global panic was the gross misbehavior of this presumed core competency. It didn’t get any coverage, but this was a symptom of the primary monetary problem not just of the panic but everything that has followed. Moneyless monetary policy performed just as you would have expected during the first worldwide monetary panic in four generations.